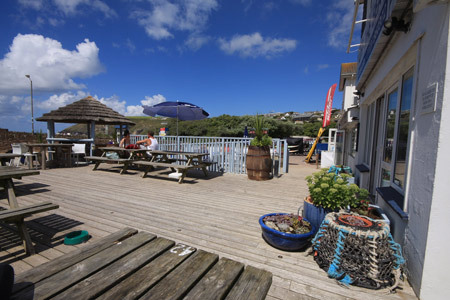 Mawgan Porth and the pretty village of St. Mawgan sit in the perfect location for a peaceful, relaxing and wonderfully memorable holiday here in Cornwall. 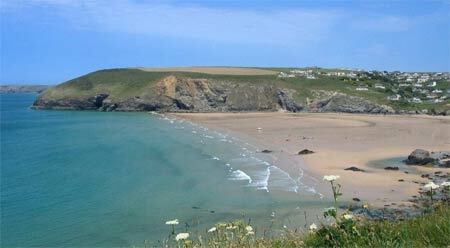 Mawgan Porth beach is a sandy bay, situated mid way between Newquay and Padstow on the rugged north Cornish coast. A west facing sheltered beach that is apopular and secluded spot for families, surrounded by rugged natural cliffs teeming with wildlife. Mawgan porth has stunning scenery, wondrous walks, superb surfing, an amazing variety of accommodation to suit everyone�s taste and pocket, fabulous food from the pub ( The MerryMoor pub and carvery, offers parking (£) directly opposite the entrance to the beach - with a patio area overlooking the sands), restaurants, cafes and takeaways and then there�s the shops of all kinds - in fact there is so much here to see and do that you�ll find yourself wanting to come back year after year, as indeed many of our visitors do. 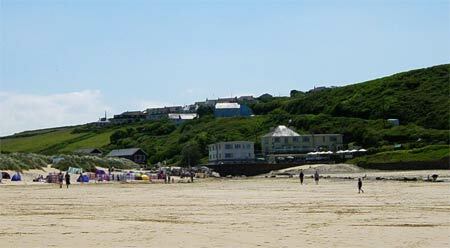 Mawgan Porth beach is set in a quiet sandy bay, with sand dunes along the ede of the beach, skirting the main road. The road, separates the beach from the local shops, car parks and cafes. Steep cliffs along each side of the bay, give a lot of shelter to the beach - making it a highly popular family holiday spot. 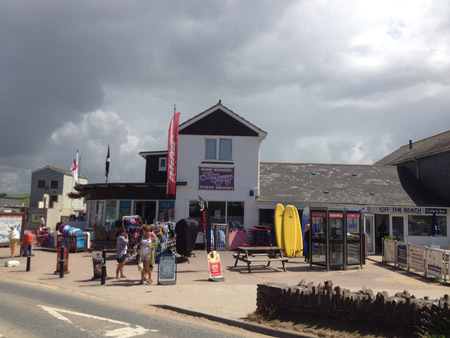 Mawgan Porth has excellent lifeguard facilities from April to September. 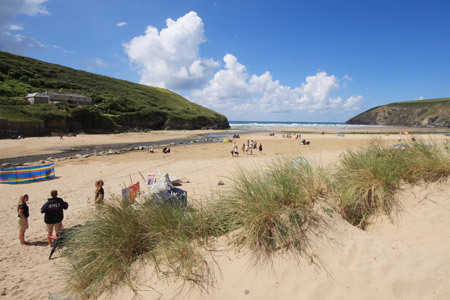 Mawgan Porth�s Sunday Times award winning beach has acres of golden sands - great for just relaxing, playing family games, making sand castles or maybe just flying a kite. Rock pools abound and there are caves to explore. The fantastic Atlantic breakers make for magnificent surfing, be it on Malibu or body boards, so there�s lots of fun for everyone, all under the watchful eye of the RNLI lifeguards who operate on the beach every day between April and September. 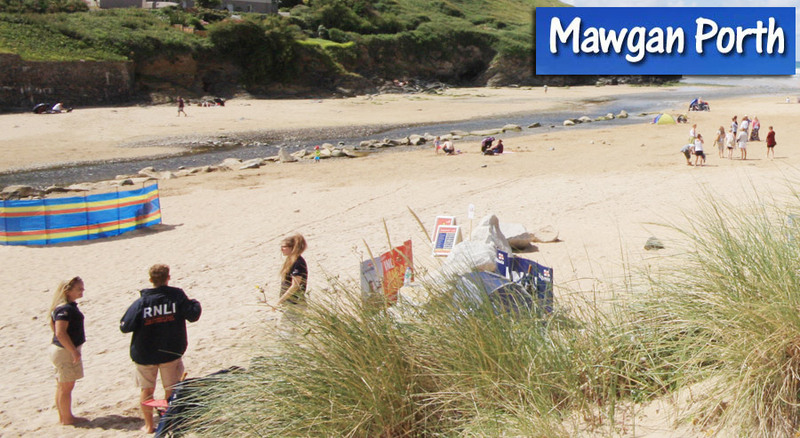 Mawgan Porth and surrounding beaches are dog friendly, but please be responsible with your pets and don�t let them interfere with the enjoyment of others using the beach. There are many activities in and around the local area such as a great pitch and putt, which incidentally sits atop an Iron Age fort, crazy golf, fishing (coarse, sea and trout), go-kart racing, surf schools, ten pin bowling, a candle factory - the list is endless. For the walkers of this life there is the South West Coastal Path which passes right through Mawgan Porth, so from here you can walk northwards towards Padstow, passing en route the starkly beautiful and legendary Bedruthan Steps, supposedly created by the giant Bedruthan walking the coastline. You can, at low tide, go down the many steps (not those of the giant though) to this long and sandy beach to walk or explore the caves. 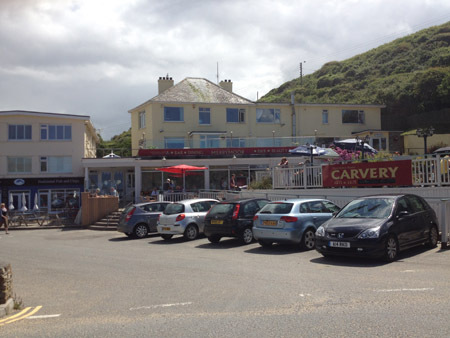 Taking the Coastal Path south brings you to Watergate Bay, Porth and finally Newquay. 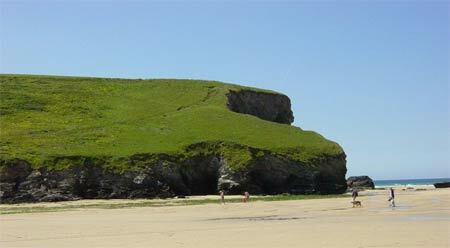 Buses are available to return you to glorious Mawgan Porth. For those of you who wish for more country views you can walk inland from Mawgan Porth, along the Vale of Lanherne for some two miles to the pretty village of St. Mawgan-in-Pydar. There is a pub within a stones throw, as is the ancient ford with the old bridge over it, and an antique shop. Crossing the village green you�ll find the peaceful Japanese garden, whilst nearby is the local craft and gift shop with its unusual and varied �object d�art�. Mawgan Porth throughout the year is host to a range of family light entertainment � there�s the Donkey Derby races in July and August during the school summer holidays, and then there�s the famous annual duck race where hundreds of plastic ducks race each other to see who can reach the bridge by the beach first. A little further afield, and to name but a few, are the Tate Gallery and Barbara Hepworth�s Sculpture Garden in St. Ives, the Eden Project at Bodelva, The Bodmin and Wenford preserved steam railway at Bodmin, and Land�s End and Bodmin Moor both with their spectacular scenery. There are so many beautiful gardens and houses to visit also, and all within a reasonable travelling distance of wonderful Mawgan Porth. All in all, Mawgan Porth is the place to be at any time of the year, so do come and visit us - we shall endeavour to make your stay here a truly memorable one - one that remains with you for many years to come.